Give this girl a Puppy! Life is tough in Zombieland. There's a lot to worry about. Money is tight. Jobs are hard. And everyone has to wear the drab zombie uniform colors so they can be spotted from afar. But normal humans went too far when they ruled that zombies weren't allowed to have dogs! How could they? Little Zoey is Zed's little sister but other than her stature there's really nothing little about her. She's got a big personality and big dreams. Even though they just opened up the school in Seabrook to her kind, she already harbors plans to become a cheerleader. Which makes sense, her brother is going to be a football player no matter what it takes. You see, Zoey is well behaved and sweet and she won't take off her bracelet. So somebody, please, get this little zombie girl a puppy! Zoey's zombie school uniform marks her as a zombie but that doesn't hold her back! Your little one will come up with all sorts of cheers when she's wearing this maroon uniform with sweet detailing throughout. Flowers are appliqued on the pleated skirt and the zippered faux leather jacket. She'll even have her zombie bracelet so everyone can be sure that she'll remain under control. Zoey might be an undead little girl but she won't let the normal people of Seabrook make her ashamed of who she is. 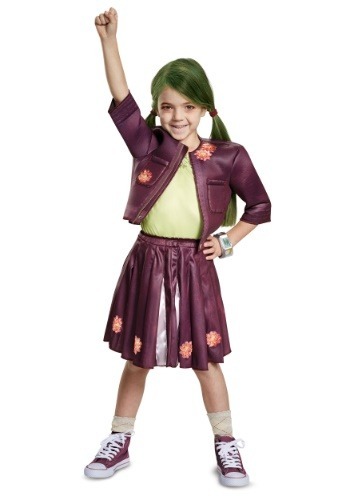 Make your little one proud of her character by polishing off this costume with a green wig or hair dye and a zombie makeup kit. She'll feel like she's stepping straight out of her favorite movie! And when she pairs up with friends or siblings wearing Zed, Eliza, and Allison costumes you might even get to see them reenact a few seasons! Encore, anyone?